﻿﻿The first detailed mapping of the regions of Colorado, Kansas, Nebraska, Texas, New Mexico and Oklahoma. A great number of landmarks are shown in the region, including the tracks of the Stephen Long expedition and with notes reflecting the Pike expedition, with extensive annotations in French describing many natural and manmade features of the area, including rivers, Indian tribal routes, cities and settlements, trade routes and geographical elevations, including reference to the region which would become Yellowstone Park. The map extends east as far as Wichita and Oklahoma City. Vandermaelen’s Atlas of six volumes was a remarkable accomplishment which mapped the entire world on a uniform scale. His treatment of the western United States was a landmark in the history and cartography of the area which resulted in twenty sheets covering territory which had been virtually uncharted and unpublished. 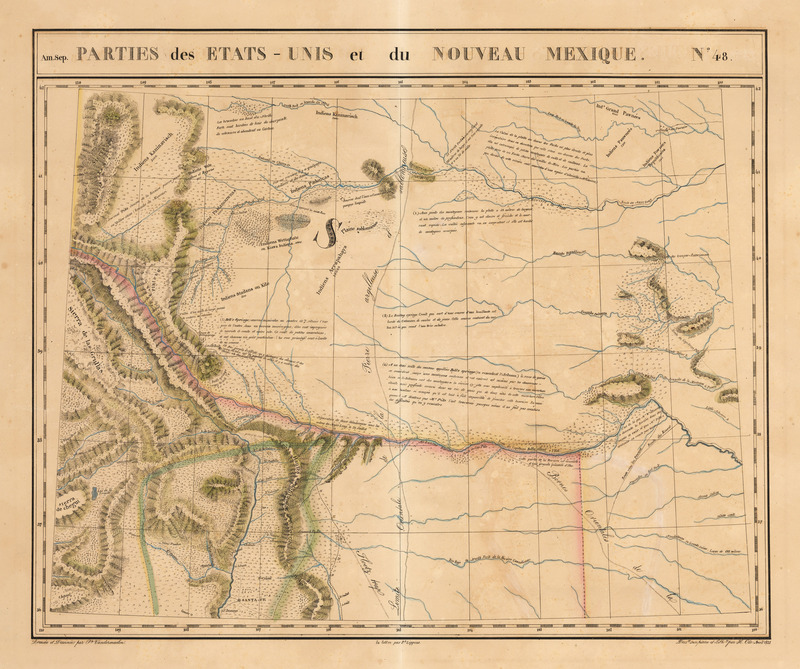 This lovely, large map comes from the first edition of Vandermaelen’s work. Condition: This hand colored map is in A condition with quite even toning and minor foxing.